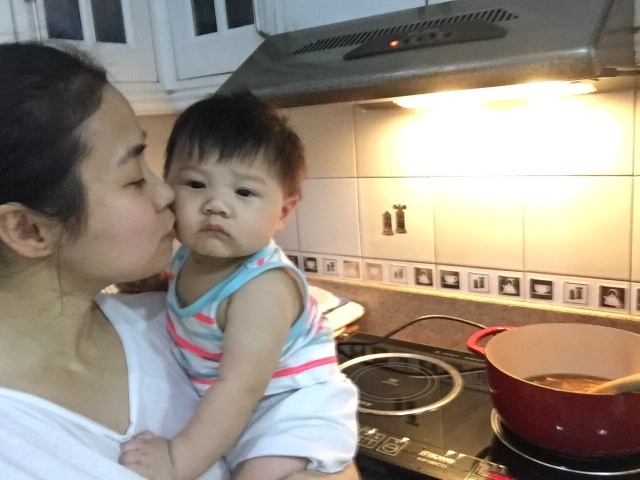 Recipe: Beef Stroganoff ~ Mommy Meowmeow! 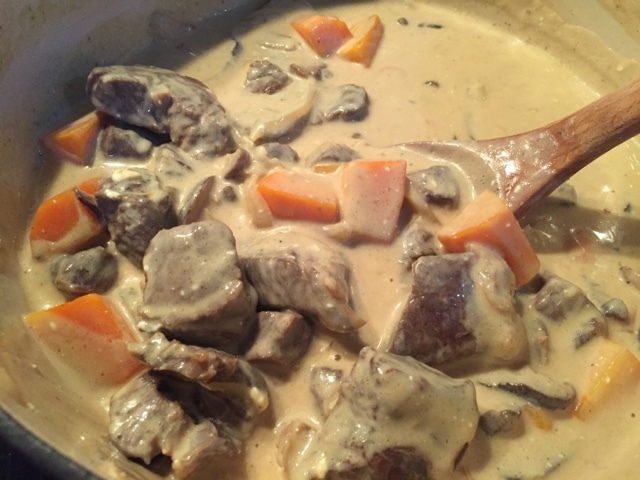 So another 'forgotten' blog in my drafts folder is this Beef Stroganoff recipe from Bree Drummond's book - The Pioneer Woman Cooks Dinnertime. Would you believe?? I actually made this back in October or November but am just blogging about it right now at the end of January. Yikes! :) Oh, and this is also the "debut" of the induction cooker from my mother-in-law :) Thank you so much! 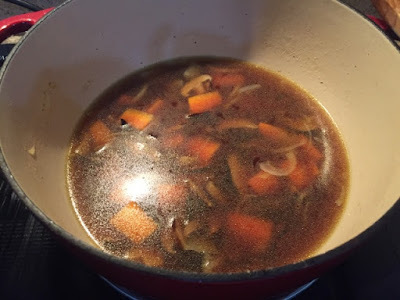 I really wanted to try it because I feel it is safer to use when I have the kids roaming around, and it cooks faster and I get to use my cast iron cookware too! :) Achieve!! Pak, ganern! Hahaha..
And from this side of the world, I was really enamored with their homesteading life & lifestyle. I mean, if I really wanted to "do it all" then this is the ultimate "doing it all". Just wow! And you know what, I really enjoyed her writing style that is very conversational. Even if I haven't heard her speak or seen her in person, I feel like I'm really hearing her voice (and maybe some of their horses in the background). Hahaha! Or was that Neiighhhh? :) Of course, I also liked her recipes and the simplicity of how it's presented. Nothing too intimidating for a beginner home cook like myself. Perhaps the part of her book that is making me look forward to when the kids are a little grown - is when they would just come in the kitchen and just scoop up a meal that I would have "effortlessly" prepared by then. Do you see that vision too? I guess you would be able to relate if like me you are also a little bit jittery (excited and anxious) every time you cook cause you want to do it perfectly, as how you imagined the taste to be. 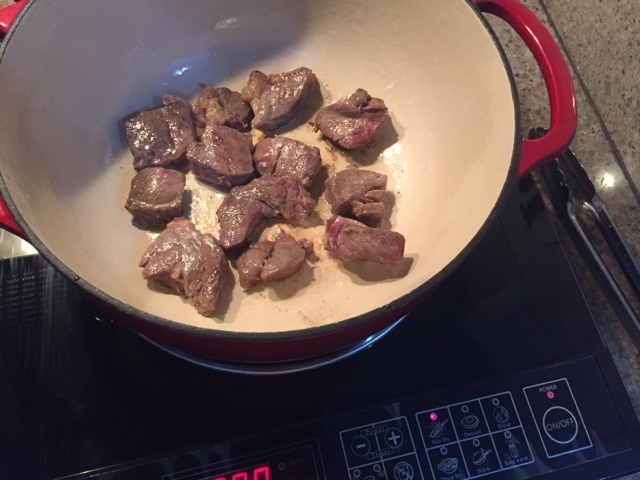 Add half the meat to the pan and sear it quickly (yes, until brown). Do the same to the rest of the meat. 2. 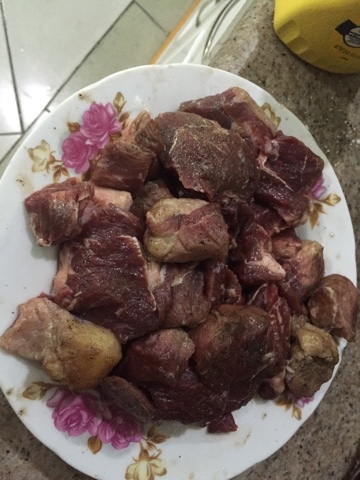 Remove and set all the meat aside. 3. 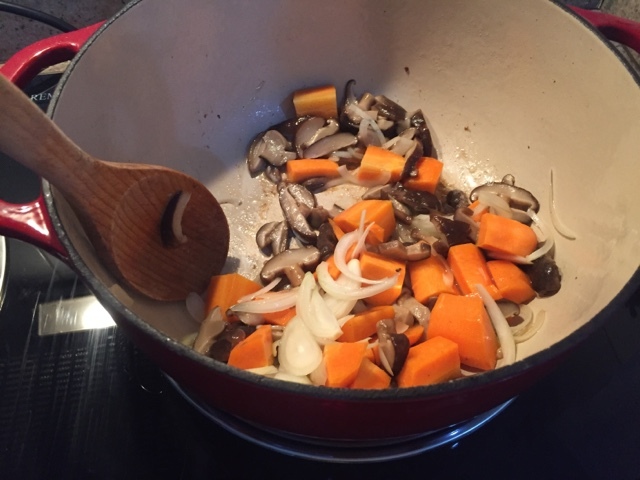 Add the remaining 1 TBSP of olive oil to the pan and add the onion, carrots, and mushrooms. 4. Cook until the mixture is deep golden brown, about 5 minutes. 5. Turn off the heat and add the brandy. 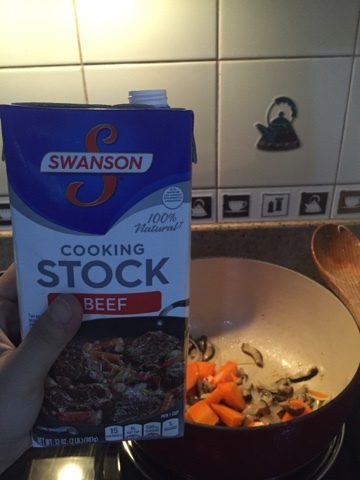 In my case, it's an additional beef stock. 6. And 2 cups of the stock. Stir, scrape the bottom of the pan and turn the heat to medium-high. 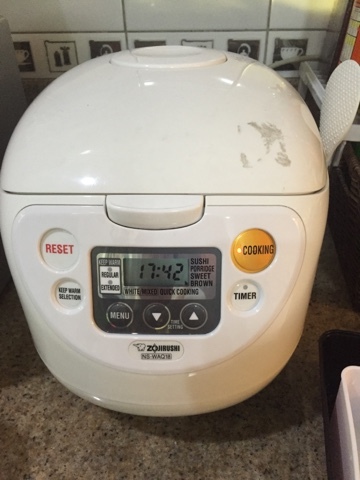 At this point I remembered to set my Zojirushi MICOM Rice Cooker to cook our rice so it gets done just in time for the Beef Stroganoff. 7. Cook to reduce the liquid by about a third, 3 to 4 minutes. 8. 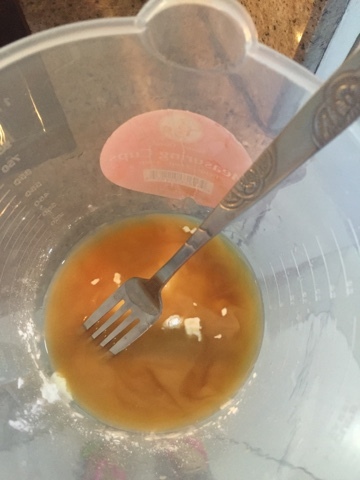 In a small pitcher, make a slurry by mixing the remaining 1/4 cup stock and the cornstarch. 9. 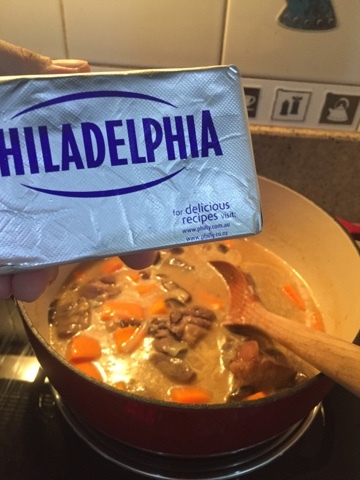 Pour the slurry into the skillet and cook until the sauce thickens, 1-2 minutes. 11. Then throw in the beef and stir until the mixture is nice and piping hot. Taste and adjust the seasonings. I also mixed in the cream cheese. BUT, the meat was a little bit tough! Guess I need to tenderize it for the next time I make this. This meal can be made ahead, especially for busy folks. Cut up the meat and prepare the veggies up to 24 hours in advance. 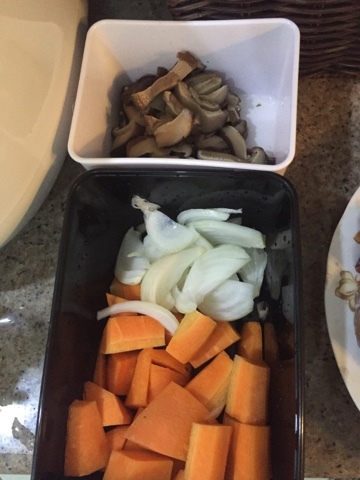 Store in separate containers in the fridge until cooking time.